Honda's Japan sales may drop 21 percent to 290,000 from 367,718 a year earlier, the carmaker's Executive Vice President Koichi Kondo has said. DETROIT (Bloomberg) -- Unemployment in the U.S. and government measures to cool China’s economy are damping demand in the world’s two largest car markets, weakening the outlook for the industry. U.S. auto sales in August were the worst for the month in 28 years, while China’s passenger-car deliveries to dealerships increased at the slowest pace since March 2009. Sales are faltering after governments withdrew stimulus measures that propped up sales in the U.S., China, Europe and Japan. The bleaker prognosis for sales may also hurt profitability as automakers including Toyota Motor Corp., General Motors Co. and Volkswagen AG are forced to offer higher incentives to lure customers. “The U.S. economy is looking downward, with high unemployment, mounting bankruptcies and other indicators that don’t paint a pretty picture,” said Yuuki Sakurai, CEO of Fukoku Capital Management Inc. in Tokyo. At Toyota, Japan-based dealers began offering incentives for the nation’s best-selling Prius hybrid even before government subsidies of up to 250,000 yen ($3,000) ended on Sept. 8. Christian Klinger, sales chief at VW, said last month that the operating environment is becoming more difficult. “Now that incentive programs have come to an end, the global automotive market is expected to decline in the second half,” Klinger said in an e-mailed statement on Aug. 13. In the U.S., September deliveries may rise as sales plunged a year ago after the August 2009 end to its ‘cash for clunkers’ program, which offered subsidies for the buying of new cars. Even so, Standard & Poor’s last week lowered its 2010 U.S. sales forecast to 11.3 million vehicles from 11.5 million. Global growth in auto sales may be limited to 10 percent to 70.4 million vehicles in 2010 and 7.1 percent next year, according to researcher J.D. Power & Associates. To boost sales, dealers may sacrifice profitability. Frank Ursomarso, a dealer in Wilmington, Del., who sells GM, Honda Motor Co. and BMW AG cars, is attracting buyers by offering to “exchange” their higher priced car for a model with a lower monthly payment. The U.S. Labor Department reported Sept. 3 the unemployment rate rose to 9.6 percent last month from 9.5 percent in July and overall employment fell 54,000 for a second month. August sales in the world’s largest auto market after China plunged 21 percent to their lowest since 1982. In Europe, a slump has been underway longer. Vehicle sales in western Europe will dip 8.2 percent this year to 12.5 million units, the lowest figure since 1995, according to IHS Automotive. Sales will likely be little changed next year, according to Ian Fletcher, an IHS analyst in London. The decline is largely due to the end of government incentives in countries including Germany, the U.K., and Italy, which prompted many consumers to push forward their car purchases, Fletcher said. Growth in China has slowed after the government raised taxes on small cars at the beginning of this year. Sales growth in August was 18.7 percent, compared to 90 percent a year earlier, the China Association of Automobile Manufactures said Sept. 9. 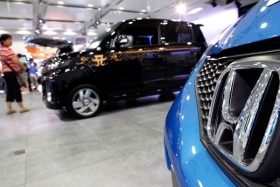 China has “slowed somewhat, but it’s still obviously very healthy growth albeit with some price pressure,” Chris Liddell, GM’s chief financial officer, said on an earnings call with investors on Aug. 12. GM, the biggest overseas automaker in China, said its unit growth was 19.2 percent in August, the worst rate in at least 17 months. said Ashvin Chotai, London-based managing director at Intelligence Automotive Asia Ltd.
Wang Ya Fei, a dealer at FAW-Volkswagen’s new outlet at Hunan Road in Shanghai is offering a 3,000 yuan ($440) discount and free car insurance for its Bora and Sagitar models as sales growth slows. Car sales in Japan, the biggest car market after China and the U.S., are expected to plunge 23 percent in the six months beginning in October from a year earlier, according to the Japan Automobile Dealers Association, after a government subsidy program for fuel-efficient cars ended this month. Toyota’s Japan sales in the fiscal second half from October may drop 28 percent, led by the Prius, according to Yoshiaki Kawano, a Tokyo-based analyst at consulting company IHS Automotive. Honda’s Japan sales may drop 21 percent to 290,000 from 367,718 a year earlier, the carmaker’s Executive Vice President Koichi Kondo said July 30. Even as other markets slow, India and Russia are major markets offering growth opportunities. Volkswagen, Ford Motor Co. and Toyota are increasing output and rolling out new models in Russia. Sales in the resource-rich nation will advance 13 percent in 2010 to 1.7 million vehicles, executives from the three automakers said last month. In India, demand for cars is exceeding expectations, Suzuki Chairman Osamu Suzuki said in New Delhi on Sept. 7. Toyota customers wait as long as three months for its Innova minivan and more than six months for its Fortuner sport-utility vehicle, the company said. Indian passenger-car sales jumped 33 percent from a year earlier to a record 160,794 in August, the Society of Indian Automobile Manufacturers said Sept. 9. Annual sales may reach 3 million by 2015, doubling from last year, according to the group. “We are seeing a change in the tide of what’s driving global auto sales,” J.D. Power’s Schuster said. “The emerging markets are paving the way to the future because that’s where most of the growth is.